The much anticipated upcoming period drama ‘Baadshaho’ is just days away from it’s worldwide release. 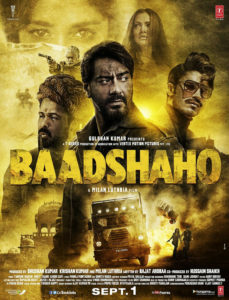 Directed by Milan Luthria, Baadshaho stars Ajay Devgn, Emraan Hashmi, Ileana D’Cruz, Esha Gupta, Sanjay Mishra and Vidyut Jammwal and will be released nationwide on 1st September by Coconut Movies. We were wowed by the trailer and have gotten even more excited with each song release. Now, we have learned the full soundtrack is now availble! The album includes additional versions of the outstanding songs Mere Rashke Qamar and Socha Hai as well as Piya More and Hoshiyar Rehna. Check out these videos for the songs and get ready to get your copy! Considering Ajay, Emraan and Milan have teamed up earlier and given us the blockbuster ‘Once Upon A Time In Mumbai’ in the past, we can’t wait for them to recreate the magic in ‘Baadshaho’ yet again. 16 queries in 1.069 seconds.